When you think of altitude, images of high forest-clad peaks by deep, dark valleys spring to mind. 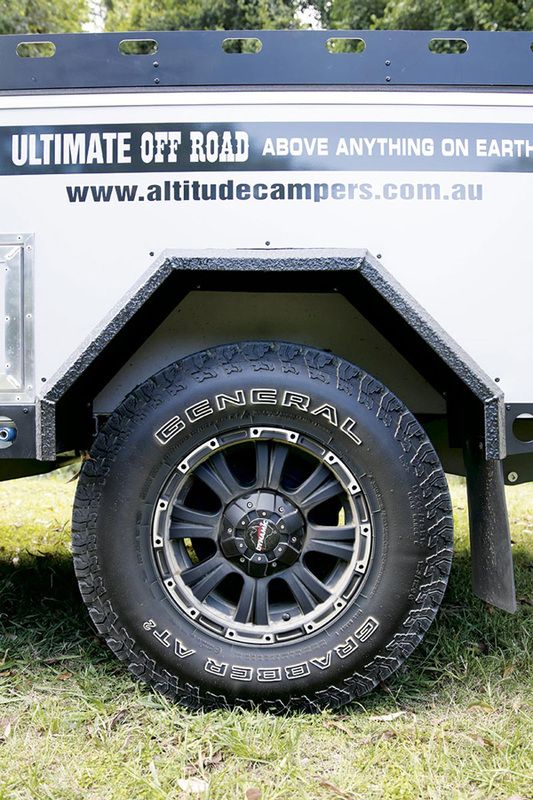 So Queensland’s Sunshine Coast hinterland, south-west of Gympie, was a fitting place to test the new Ultimate by Altitude Campers. 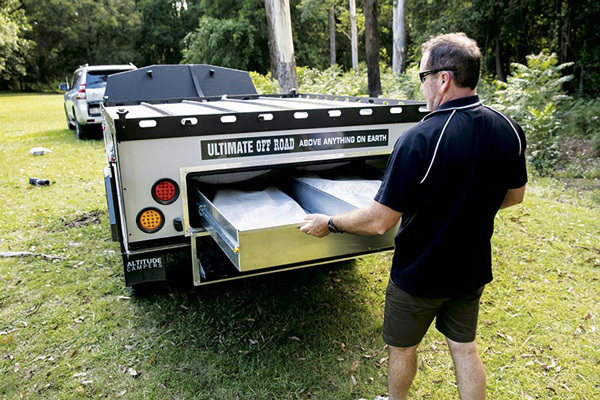 Director Brian Johnston launched Altitude Campers a little more than two years ago on the back of previous manufacturing and camper hire businesses, with the view to establishing the Maryborough facility as a source of high quality, value-packed, Aussie-made camper trailers. So, with that lofty ambition, my chance to play with this camper came with great expectations. 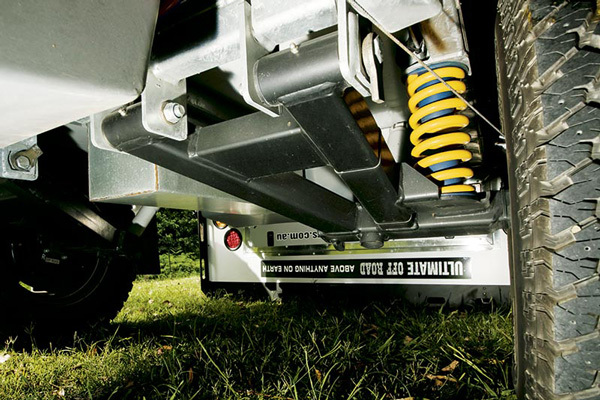 We hitched the camper to our tow vehicle with the Ultimate’s Vehicle Components Hitchmaster DO35 hitch. 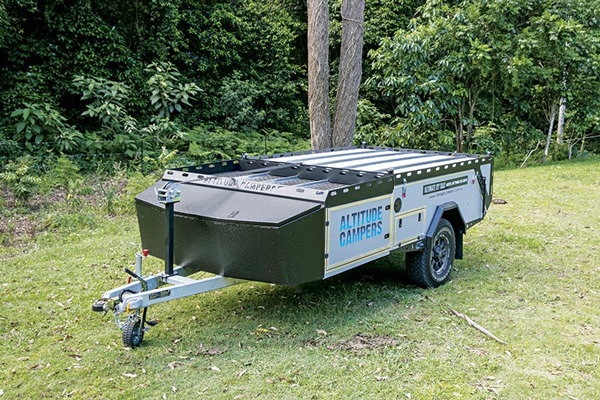 That’s the right sort of kit for the job, considering it has a load rating of 3.5t, which is ample for most camper trailers including this one. 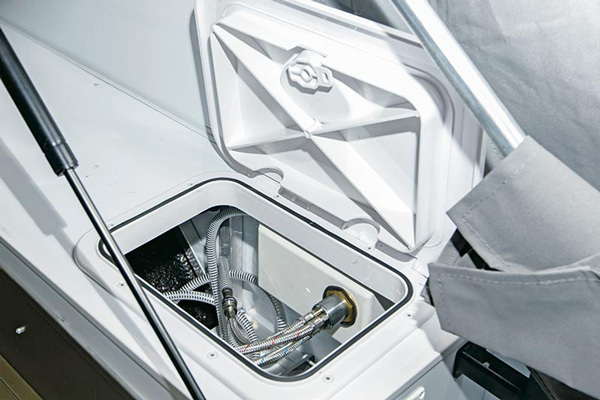 It was part of the equipment list that also included Vehicle Components Cruisemaster coil-sprung suspension and a sturdy construction which convinced me it could cope on tracks a little bit tougher than those it conquered on our test run. 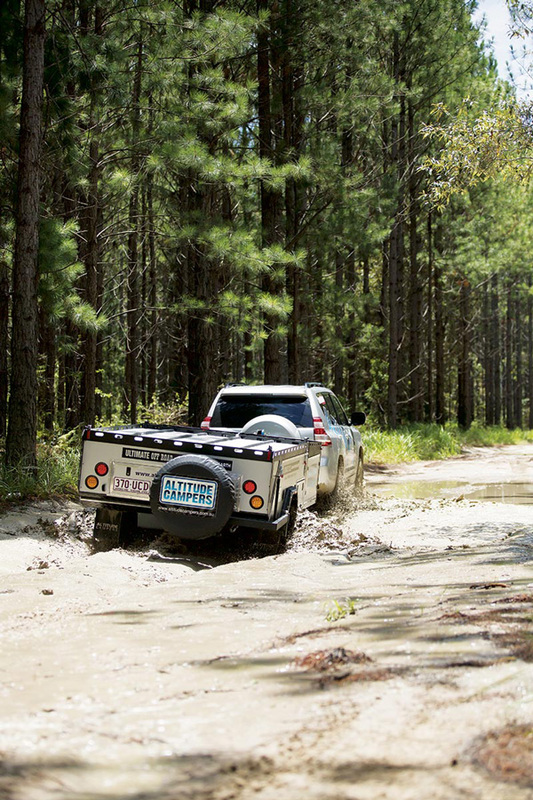 Everything looked very promising when we arrived at camp, as the main tent was easy to set up in a matter of minutes. In next to no time, we had the tent unfurled were opening up the windows and doors – this is great news for anyone travelling with kids or just doing an overnight stop en-route. 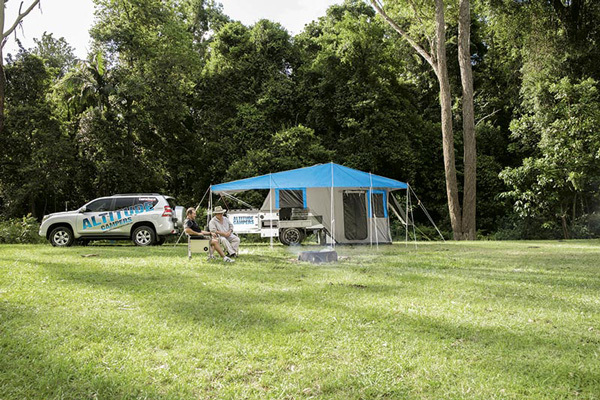 Camping in Queensland’s Sunshine Coast hinterland comes with the potential for hot, humid days, so airflow around the tent is important. 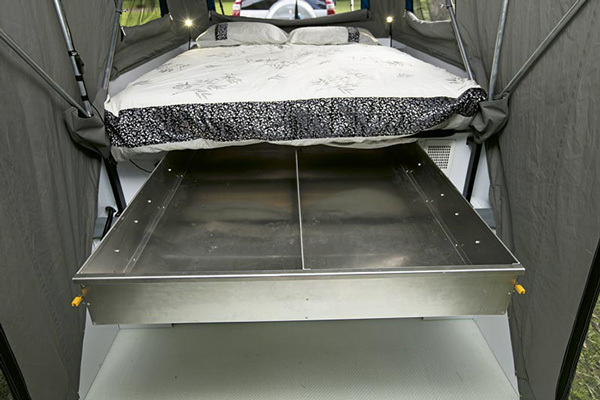 Consequently, it was great to see the camper’s tropical roof, which was set as a fixture on the roof of the tent, automatically deployed without fuss as we rolled the tent off the trailer. While the speed and ease of the basic setup was a big plus for those wanting to swiftly settle the kids in the shade, establishing a more elaborate camp is a slightly different story. 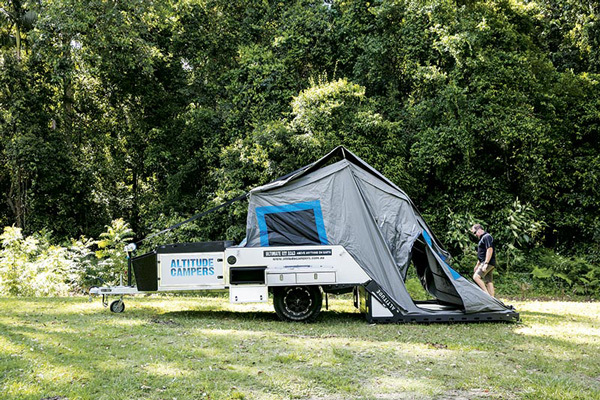 On the plus side, the Altitude Ultimate has a large awning that more than doubles the living space but its size means it chews up time getting it set up, with many poles and struts required to get it looking right. The bedroom has reading lamps for the bed and general purpose lighting courtesy of a central LED strip. 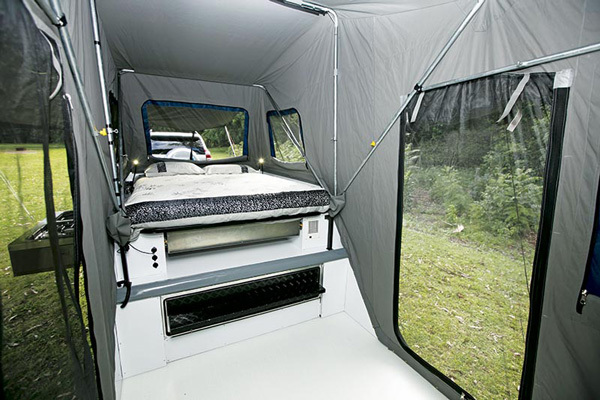 The internal dimensions are within the scope of a typical hardfloor camper, although a strip of vinyl below the innerspring mattress allows for a bit more room under the canvas, making it a comfortable space for two or a few. The main annexe has hook and loop fasteners on the walls for an optional room if you need more. 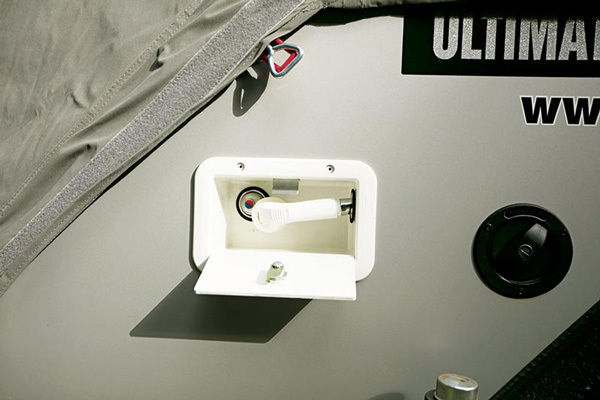 In terms of external storage, the camper has a front boot for the jerry cans, diesel heater and gas bottles and behind that on the driver side a huge open hatch for wet camping gear. 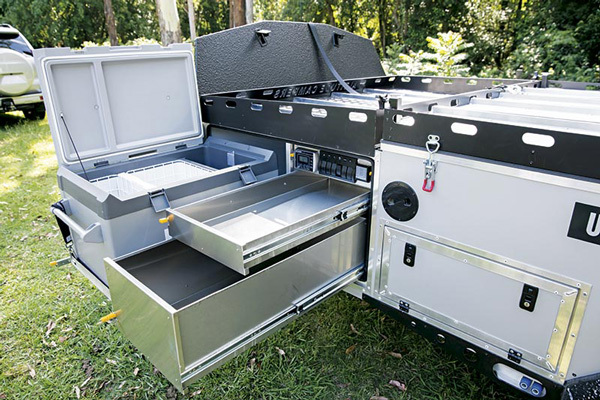 The slide-out kitchen, with a Thetford Spinflo cooktop triple-burner gas stove and sink, is the third surprise, as it opens out on a hinged mount. 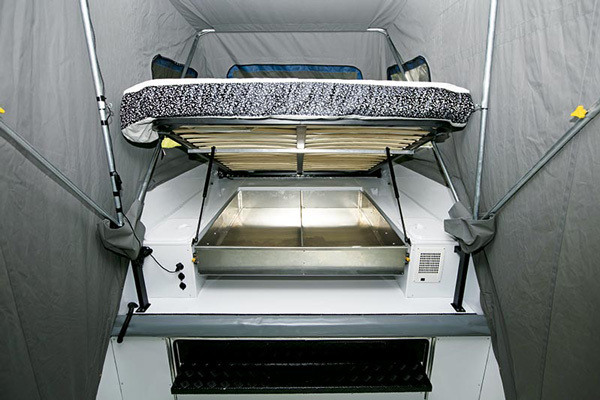 This allows the chef to change the position of the kitchen, locking it parallel to the tent or at 90° to suit the weather or their needs. Immediately beside the slide-out kitchen is a generous twin drawer pantry and next to that is a fridge slide with an 80L Waeco fridge-freezer on board. Weighing in at around 29kg and drawing something like 2A, this fridge is a worthwhile inclusion. 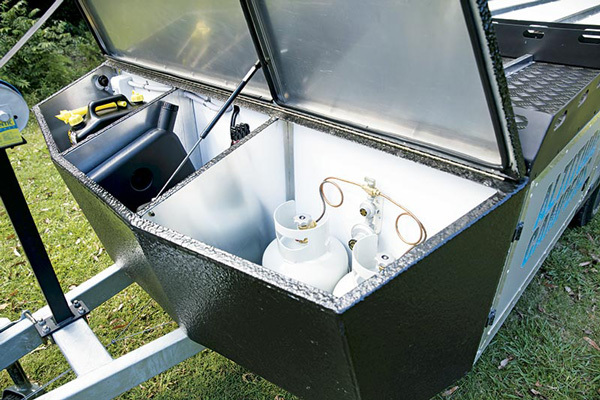 The pantry hatch also provides access to the battery management system. This makes this kitchen area feel much like a general utility hub where you can turn your snags, switch on the heater and make sure your batteries are charged within reach of a cool beer. 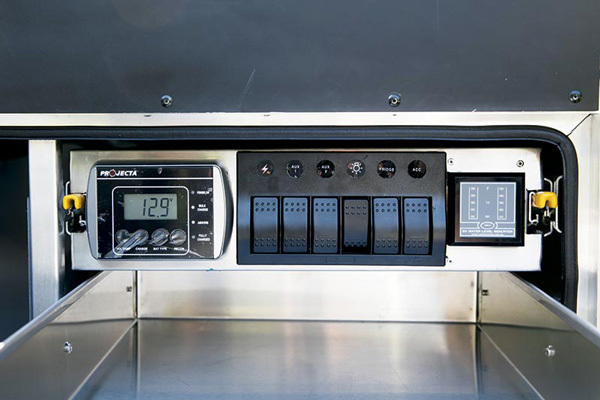 The camper’s electrical system runs off two 120Ah AGM batteries and a Redarc 1230 Battery Management System which, like the fridge, are accounted for in the 980kg Tare. For my money, the nice thing about this system is that it’s got a bit of a green preference. That is, if 12V solar power input is available, solar power will be chosen to top up the batteries before relying on a mains source or DC vehicle power. With the power sorted, LED strip lighting helps you find your way around at night and you can plug your gadgets in any one of three easily accessible 12V. 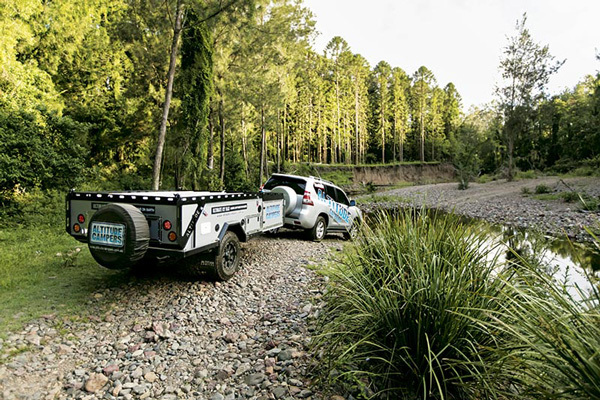 The Ultimate by Altitude Campers is a great camper for two people or a small family and is equally suitable for an outback long-haul or a quick getaway on the weekend. The degree of fitout belie the simple yet strong and lightweight design. Solar panels and annexe walls would complete it for me.